Read the Guardian report by Patrick Wintour here. 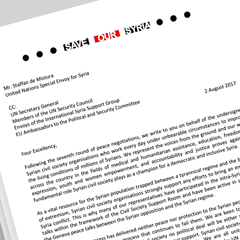 Following the seventh round of peace negotiations, we write to you on behalf of the undersigned Syrian civil society organisations who work every day under unbearable circumstances to improve the living conditions of millions of Syrians. We represent the voices from the ground and our work across the country in the fields of medical and humanitarian assistance, education, freedom of expression, youth and women empowerment, and accountability and justice proves again the fundamental role Syrian civil society plays as a champion for a democratic and inclusive Syria. As a vital resource for the Syrian population trapped between a tyrannical regime and the brutality of extremism, Syrian civil society organisations strongly support any efforts to bring an end to the Syria conflict. This is why many of our representatives have participated in the intra-Syrian peace talks within the framework of the Civil Society Support Room and have been active in supporting the Geneva peace talks between the Syrian opposition and the Syrian regime. Sadly, the Geneva process has delivered neither peace nor protection to the Syrian people who are increasingly disillusioned with a process that continues to fail them. We are keen to reverse this trend as without the support of Syrian civil society no political deal will be either sustainable or legitimate, and right now the current process is losing our support. Syrian civil society’s priority is to achieve an inclusive transition to a free and democratic Syria. We are all united around this outcome which defines the basis of the Geneva peace process as set out by UN Security Council Resolution 2254 and as reiterated in your mandate as UN Special Envoy for Syria. We expect all parties in Geneva—including you—to work for this purpose and engage in serious negotiations. The time consumed on discussions around process and representation, at the expense of a credible and realistic political deal for transition towards democracy, is not only wasting precious time but it is also undermining the international community’s efforts to fight terrorism in Syria. Syrian civil society activities are essential in the fight against extremism. Moderate voices—as we represent—have the power to push back against the extremist forces and fill the vacuum on the ground. But to be able to do so, we need the international community to protect our ability to assist and serve our people. This is why we need the Geneva process to prioritise the protection of civilians and deliver meaningful negotiations that lead to peace for Syria. From the onset of the Geneva talks we have pressed for an active role in shaping the process given our links to the ground. As a result we continue to welcome efforts by the Syrian opposition to broaden its membership as long as it shares our purpose of achieving a political transition that is in compliance with international humanitarian law. But many members of civil society are troubled by some international actors’ attempts to dictate who sits around the negotiation table. For the Geneva process to be truly inclusive and Syrian-led it must serve the Syrian people’s aspirations first and foremost for a transition towards a democratic and free Syria. Allowing the priorities and direction of the process to be shaped by international actors has only weakened the process and diverted it from its central function. 1. Ensure that the Geneva process serves the interests of Syrians, first and foremost, and is not driven entirely by international actors. This requires a re-focus of the Geneva talks onto transition, as per UNSCR 2254. The international community, including the Permanent Five members of the Security Council, have confirmed the principal aim of the Geneva process is transition. To achieve this aim we call on you to use your authority to effectively hold to account any party at the negotiations that continues to stall and undermine the Geneva process. 2. Draw from the legitimacy and unique contribution of Syrian civil society to ensure a sustainable political agreement for Syria. This includes using civil society’s expertise on the four baskets to unlock progress in the talks and move to concrete discussions towards transition. 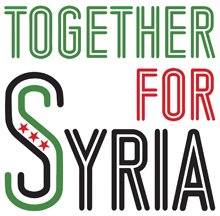 Only Syrian civil society can create the broad buy-in from the ground for any political agreement. 3. Demand the enforcement of UNSCRs that call for the protection of civilians to make the Geneva process viable. To do so, we urge you to press the parties to the conflict and especially the backers of the Syrian regime to enforce a sustainable nationwide ceasefire with a UN-led monitoring mechanism and credible enforcement. This is clearly illustrated by the regime’s and Russia’s ongoing violations of previous commitments, including from Astana, as well as by the unlawful killing of civilians due to counter-terrorism operations of the anti-ISIS coalition. Civil society organisations active on the ground are ready to cooperate with a credible and impartial monitoring system but we need you, the UN, toassert your role and ensure the impartiality of the ceasefire monitoring. 4. Ensure that concrete progress on humanitarian access, the detainee file and forced displacement is at the heart of the Geneva negotiations. In particular, we call on you to fulfil your mandate and ensure progress on the detainee file including by securing (i) a comprehensive plan for the release of detainees beyond small-scale prisoner exchanges; (ii) information about the fates of all Syrians forcibly disappeared; (iii) access by international monitors to all detention facilities; and (iv) a halt to execution orders, particularly in regime security and military facilities, as well as in those run by armed groups. As UN Special Envoy for Syria you can rescue the current failing Geneva process and compel serious negotiations that serve the needs and demands of the Syrian people. 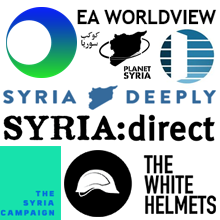 The undersigned Syrian civil society organisations stand ready to assist you in this effort, but we need you and the international community to implement a credible process that will enable us to build a democratic, free and just Syria for all Syrians.